For gorgeous beetroot like these you’ll have to get off to a weekend farmers’ market, or grow them yourself. Just think, if you start them off now, they’ll be yours by mid-summer. How cool would that be! 2 Peel beetroot and slice beautifully thinly either on a mandoline or with a sharp thinly bladed knife. Peel tangelos with a serrated knife, removing all the white pith. Slice in between the flesh and membrane, releasing the tangelo fillets. 3 Fry pumpkin seeds in a splash of oil heated in a small pan (skillet) for a minute or two. Keep an eye on them as they darken quickly. Transfer to a plate lined with paper towels and sprinkle with sea salt. Cool. 4 Arrange beetroot slices, radish and tangelo segments on plates. Scoop labna into oval blobs and arrange on plates. Sprinkle with dukkah or ground cumin. Scatter everything with edible flowers and pumpkin seeds. Season with a few pinches of sea salt, dot with vinegar or lemon juice and drizzle with extra virgin olive oil. Serve immediately. 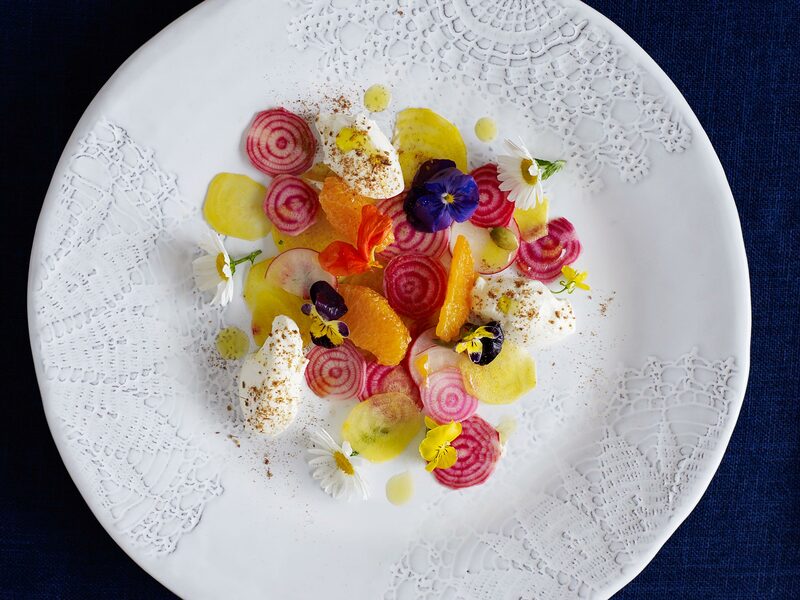 A picture on a plate – how stunning!